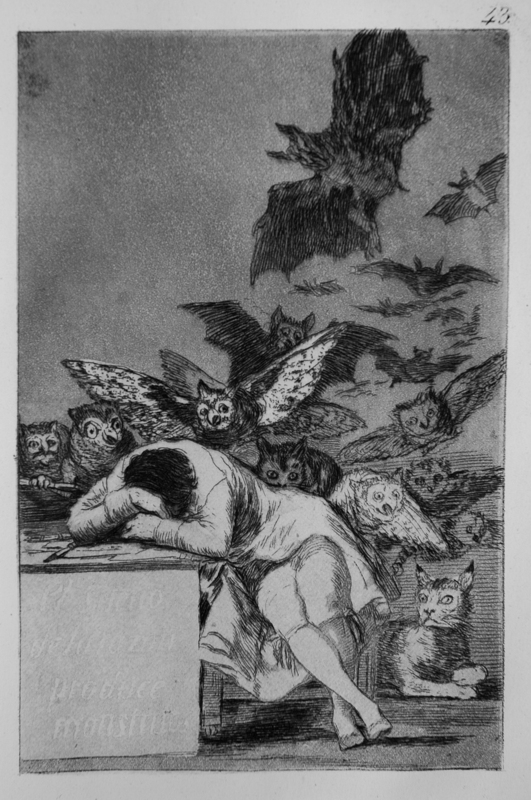 Los caprichos are a set of 80 prints created by Francisco Goya in 1797 and 1798, and published as an album in 1799. The prints were a criticism of the Spanish society in which he lived. The criticisms are far-ranging and acidic; he speaks against the predominance of superstition, the inabilities of the ruling class, marital mistakes and the decline of rationality. Some of the prints have anticlerical themes. The work was an enlightened critique of 18th-century Spain, and humanity in general. 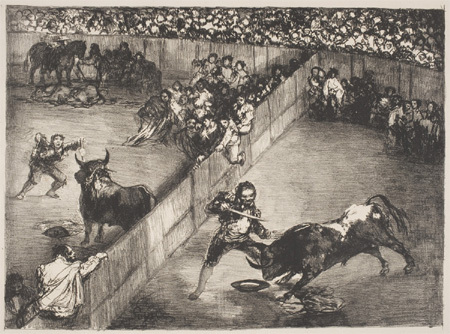 The informal style, as well as the depiction of contemporary society found in Caprichos, makes them (and Goya himself) a precursor to the modernist movement almost a century later. The Sleep of Reason Produces Monsters has attained an iconic status. The aquatint plates of The Disasters of War in the 1810s are considered as a visual protest against the violence of the 1808 Dos de Mayo Uprising, the subsequent Peninsular War. The scenes are disturbing, sometimes macabre in their depiction of battlefield horror. They were not published until 1863, 35 years after his death. It is likely that only then it was considered politically safe to distribute a sequence of artworks criticizing both the French and Bourbons. The first 47 plates in the series focus on incidents from the war and show the consequences of the conflict on individual soldiers and civilians. The middle series (plates 48 to 64) record the effects of the famine in Madrid in 1811–12, before the city was liberated from the French. The final 17 reflect the bitter disappointment of liberals when the restored Ferdinand VII rejected the Spanish Constitution of 1812. 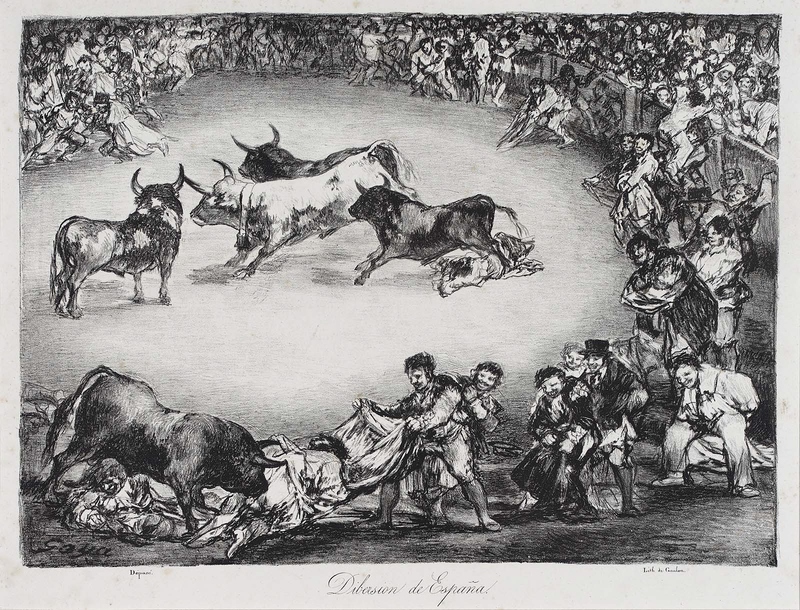 In 1825 he made the series Los toros de Burdeos (The Bulls of Bordeaux) (1825), which were his latest prints. Delacroix purchased a copy of them. 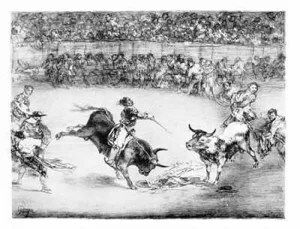 Indicative of Goya´s love for bulls is the fact that he signed one of his letters as Francisco de los Toros (Francisco of the Bulls).